Jack Meijer was the star for MMKAC at the annual England Athletics u17/15 Championships held at Bedford. He qualified for the under 17 men 1500m final with a near PB time of 4.00.69. Sixth place in a prestigious final gave Jack a club record of 3.59.02, improving from his 3.59.40 set at Watford in June. David Boakye ran 11.29 for 6th place in his heat. Abi Fitton ran a PB of 40.73 in her heat of the 300m to make the final. This moves Abi up to no 4 in the club all-time rankings. She then placed 7th in the final with a slightly slower time of 41.11. For the under 15 girls Eva Durand threw the javelin 35.64m, her second best distance this summer, for 6th position whilst Lara Moffat took 11th place in the hammer with 32.36 Moyin Oduyehi made it through to the semi-finals of the under 15 girls 100m(12.69 in her heat), and the equalled her PB of 12.47, 4th place and just failing to make the final. Ella Carey clocked 2.22.35 in her heat of the 800m placing 7th. 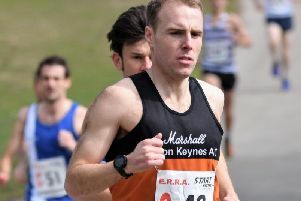 The previous weekend Jack competed in the British Milers club races at Stretford, Manchester. He won the “Peter Coe” trophy by virtue of winning the under 17 men’s mile race in a time of 4.21.65. Not only a club age group record but the 5th fastish time by any MMAKC runner for this distance, albeit only rarely run these days.